Watching 360 degree videos on the HTC Vive can be a wonderfully interesting experience, and one that is certainly recommended. There was a time when there weren’t that many 360 degree videos available, but times have changed. What’s changed is that now there are a lot of 360 degree cameras on the market. There’s the Gear 360, that you can carry around anywhere, and small enough to – almost – fit into the palm of your hand. Cameras like the Gear 360 allow people around the world to effortlessly make 360 degree videos… of anything they choose. And they do – there’s a whole new culture of amateur movie-making beginning to evolve around 360 degree videos. So you’ll find lots of videos of different kinds on YouTube. There are videos of wonderful panoramas, of nature, of historical sites, of people jumping off aircraft (with parachutes), of people bungee jumping (without parachutes, and sometimes they regret it, but not on video). Actually, they’re on a lot of places beside YouTube, but YouTube is a great source. So if you have a lovely 3D headset like the HTC Vive, you can watch these videos as they should be watched, in wonderful stereoscopic high resolution. The HTC Vive brings Virtual Reality videos as close to reality as they’re likely to get. The simplest – though not necessarily the best – way to watch 360 degree videos is through Vive Video. 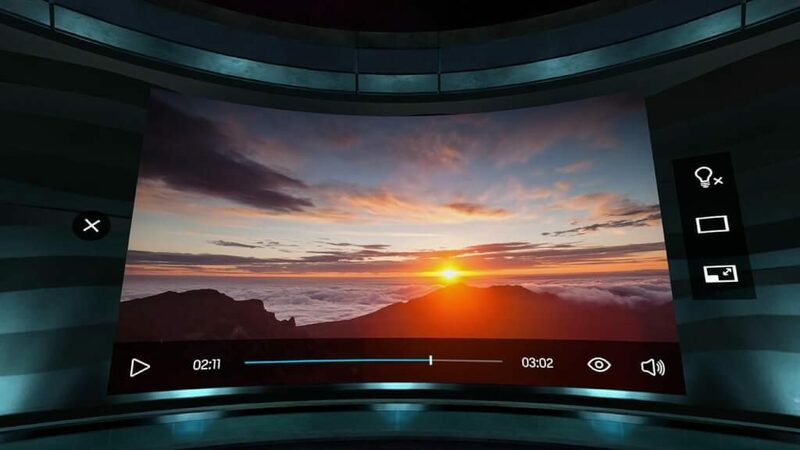 This is a dedicated video player that HTC has come up with, and while it may have been created by one company, it has been designed to work across multiple VR headsets, which means that the Oculus Rift can also support it. And HTC distributes it for free. You can find it on Viveport, but it can also be downloaded on Steam. One nice thing about Vive Video is that, in keeping with HTC’s policy, it has been entirely designed around letting you use HTC motion controllers inside the video. It goes without saying that it can be used with a keyboard or mouse, but the motion controllers really allow for a very relaxed and intuitive experience. If you want to watch videos directly off YouTube, you’ll need a paid app. We’ll talk about that later. For now, just download the videos you want to watch from YouTube using any one of a number of apps that are available. Then find the video in Vive Video, and click on the file. The file will begin to play, but not in 360 degrees. To do that, you’ll need to, using the ‘eye’ icon that you’ll find in the controls bar (take a look at the image above), select the Viewing Mode. You’ll have to select whether the video is Mono or Stereo, depending on whether it’s a normal 360 degree video or a stereoscopic (a true 3D) one. Once you click on your choice, other options will appear, in which you have to select ‘360’. That’s it, you’re set and you’re good to go. This is a good way to watch 360 degree videos on the Vive – it’s free, and it’s by HTC themselves. However, if you don’t find this intuitive enough, there are paid apps on the market as well. Virtual Desktop is a good app, if you’re interested in a smooth, streamlined app that will play your 3D videos effortlessly, directly from a YouTube URL. Yes, all you have to do is paste in the URL, and Virtual Desktop will start streaming the video, with most of the video options already set. Previous articleWhich Bluetooth Gamepads/Controllers Are Supported for Gear VR? Next articleFall in Love VR – Pure Hype, or great ‘NPC’ characters?